Yes, another Disney entry, but it’s a quick one, and a silly one at that. At the moment one of the most popular attractions at Disney Hollywood Studios in Orlando, Florida is Toy Story Midway Mania. It’s good old fashioned shooting gallery fun with a 3-D twist and combined into a five to ten minute ride. The wait to get in is crazy, sometimes up to an hour, and during the wait you wind through a maze of gigantic toys from childhoods past including Scrabble, Tinker Toys and Lincoln Logs. While you’re there, check out the twisted scoring for Scrabble on the ceiling. And what does this have to do with French fries I hear you asking? Lots. Sort of. Other than the giant variety of giant toys, your entertainment for this waiting line is the one and only Mr. Potato Head. 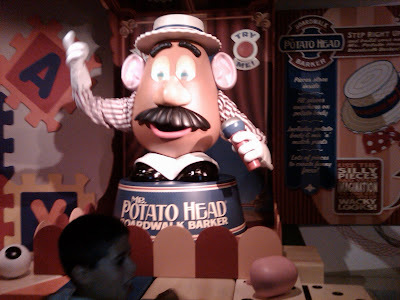 Voiced by Don Rickles, just as he is in Toy Story 1 and 2, and presumably 3 as well, he is fully animatronically alive with stunning projection animated eyes. Mr. P (or is that R?) tells jokes and sings and keeps the time flowing throughout the experience in his guise as a Boardwalk carnival barker. It makes what could be an unbearable wait almost a joy. Quite a show, and just for the record, one hell of a ride too.